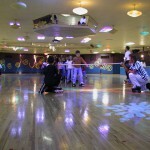 Have a very special birthday party at Roller Dome Skate Centers! You are going to love our party plan! For parents, entertaining the whole gang can be a real bear… until you take the whole gang roller skating! Check out our Party Packages and our exciting Birthday Party Add-ons. Contact us at 260-483-6303 for more information. Reserve your party today by phone or online! Birthday child will be the guest DJ for one song! $50.00 Non-refundable Deposit required for Super, Deluxe and Supreme packages.